Each week, the Science outside the Lines (SOTL) crew, consisting of 3rd and 4th grade students at Henderson-Hopkins Elementary school, embarks on a journey to explore the inherent similarities between the arts and sciences. Whether it’s finding the connection between cell biology and Pointillism or engineering rovers for space exploration out of recycled materials, students are bound to gain a new perspective on arts and science integration. Class begins with a brief and interactive lesson lead by graduate students and post docs from Johns Hopkins and the lesson culminates in an art project specifically designed to reinforce different scientific concepts. Working with our community partner, Art with a Heart (https://artwithaheart.net/), we are able to supplement both the art and science curriculum for our students in a stress-free, after-school environment. If you are interested in honing your skills in leadership, mentorship, and communication by volunteering with SOTL, please reach out to Molly Gordon. Volunteers are specifically needed to lead and plan lessons and staff the classroom. SOTL is made possible by the American Society for Cell Biology. Combine brief presentations from expert science communicators with breakout sessions which allow participants to hone their science ‘pitches’, present them to the group, and get immediate feedback. Scientists give brief, 5-minute presentations of their work to a general audience and compete for prizes for the best communicated and most creative talks. Slams take place in various public spaces around Baltimore, such as Red Emma’s Café and De Kleine Duivel. An immersive, interactive art installation that teaches the basic principles of how the brain works. This project is made possible by Two Photon Art. ​Science at the Market is a monthly event during the warm months of the year (typically April through September). We set up a booth at the 32nd Street Farmer’s Market on the last Saturday of the month for the whole time the market is open, and there we host some fun experiments centered around a theme that both kids and adults can do. Previous examples of our outreach include DNA, water, insects, fermentation, and taste. If you’d like to see us in action or help volunteer, please reach out to Joshua McCausland and ask which days Project Bridge will be at the market! ​The Brain Connect committee works to host Brain Awareness Week events each year. The Brain Connect began in 2018 as an effort to educate and engage the Baltimore community during Brain Awareness Week. It consisted of short neuroscience lessons in Baltimore city schools which taught neuroanatomy and function through collaborative art projects. Project kits were sent to schools and community centers across the city, and city residents were asked to create an artistic interpretation of their response to the question "What's on your mind?". In a culminating event at Port Discovery, we showcased the artwork of Baltimore city residents and had hands-on brain related demonstrations for the public to learn about all the amazing things the nervous system does. For Brain Connect 2019, we plan to expand beyond the city of Baltimore and include other areas of Maryland. Brain Connect 2019 will culminate in the Baltimore Brain Fest! ​The Science Gong Show is a science communication event held at Charm City Meadworks. The goal is to create a dynamic learning environment where Baltimoreans can learn more about the exciting research scientists are performing on a daily basis. Also, in creating this event, scientists will be able to hone their communication skills. To do this, scientists deliver a brief (4 minute) presentation without slides on their chosen topic that concisely describes the science behind the topic and why it's important. However, if the scientist uses any jargon (i.e., undefined words and phrases only understood by other scientists), the audience members will "gong" the presenter with provided cowbells. When this happens, the scientist must stop, define the jargon used, and re-describe their work without using the undefined phrase. 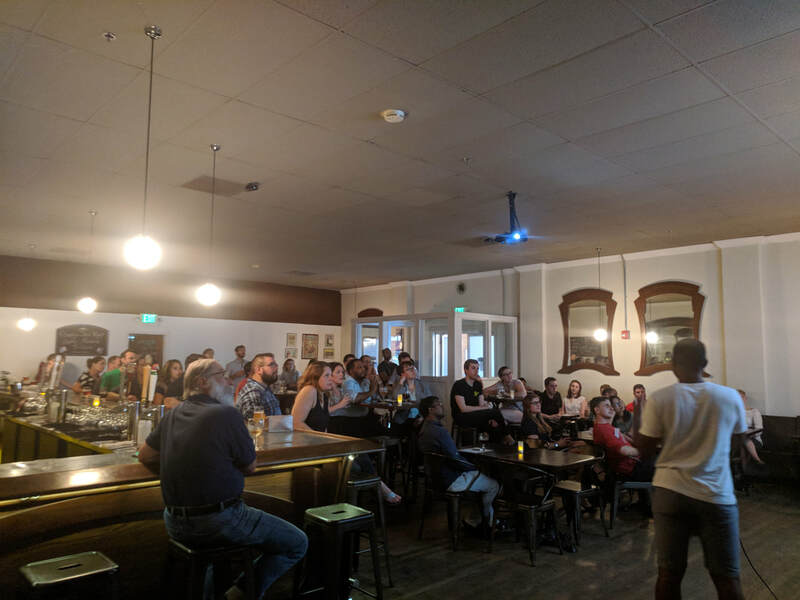 The Baltimore Science Cafés bring local scientists to the community for casual conversations about their research. Topics span all areas of science, from gene editing to NASA probes to political polling methods. Researchers briefly present their work using only a whiteboard, followed by Q&A with the audience. The cafés are held in venues across Baltimore to better engage the diverse populations that call Charm City home. We hope this environment fuels interactions between scientist and non-scientist neighbors! Watch Project Bridge social media for the next event! ​Baltimore Brain Fest is held every year as the culminating event for Brain Awareness Week. Community partners, Johns Hopkins affiliates, and Project Bridge volunteers come together to host an event filled with fun experiments, games, crafts, and other activities to learn about the brain. Come check out our brain-themed escape room, compare brains across the animal kingdom, and take home your very own brain-themed artwork. If you would like to learn more about how you or your organization can get involved in Baltimore Brain Fest reach out to Isabelle Malouf. More information about Brain Fest can be found at our website, www.brainfest.org.